This area will be updated with major events that either affect entire regions or the continent as a whole. Located in the north-west of the planet Valucre, Genesaris is approximately the size of the Eurasian continent with a population of approximately 218,000,000 in the current year. Genesaris is divided into a total of six massive regions, these being: the Great North, the Cold South, the Rising West, the Southern Swell, the Arcane East, and the Midlands. Each region has its own climate, which varies according to the season and specific locations within each land. In the north, the calm waves of the warm sea extend well beyond the northern shores. Summer is nearly eternal here, and the citizens rarely know the hazards of snow and hail. Grasslands, forests, and gentle hills provide a peaceful and welcoming atmosphere, which in turn has made it one of the most densely populated regions on the continent (with some of the largest cities in all of Genesaris). To the south, one finds the antithesis of warmth and hospitality. The south is dense with thick, untamed forests and bitter mountain chains, shrouded in an icy fog and nested in banks of snow that do not melt. The savage wilds of the south are considered some of the most dangerous in the world, filled will all manner of beasts. These harsh conditions have made the south unfit for living, spare for the hardiest of people. The eastern lands find themselves at the foot of the Cold Mountains, which runs the entire length of the coast. From this footing, a seemingly endless sea of green and golden grasslands reaches out to the west, dappled with mighty forests and woodlands throughout. However, in spite of its richness in beauty, this is a land plagued by violent magical storms and naturally dreadful winters. In the west, one can find a myriad of seasons and climates throughout the year. These have given rise to the scorching Velhatien Desert and the cool, lush tropics of the Bloodstone Marsh. The mountainous chain directly to its south rises high and large, thick with trees, woods, and natural resources. The sea cuts deep inland, providing coastal temperatures for those that dwell there. It is at the heart of the continent (the Midlands) that all of these climates and geographical differences meet. Here, one experiences all seasons from soft snow in the winter to gentle rains in the spring. No season is known to naturally overpower the other, and a collage of natural landmarks and scenery provide all the beauty of Genesaris in one location. Genesaris has plant and animal life recognizable to most characters, such as: flowers, trees, dogs, horses, crabs, salmon, etc. and so on. In addition to this standard, there are a number of animals and plants unique to Genesaris. Be sure to check each region's bestiary and herbology index for region-specific entities. Note that users aren't limited to what's included in the present material and are free/encouraged to come up with plant and animal life as long as they adhere to the Mild Powers rules. Users can also make bestiary submissions if they want to formalize information about their creations and make them available for public use. Genesaris is comprised of four distinct territories, each with their own capital city. 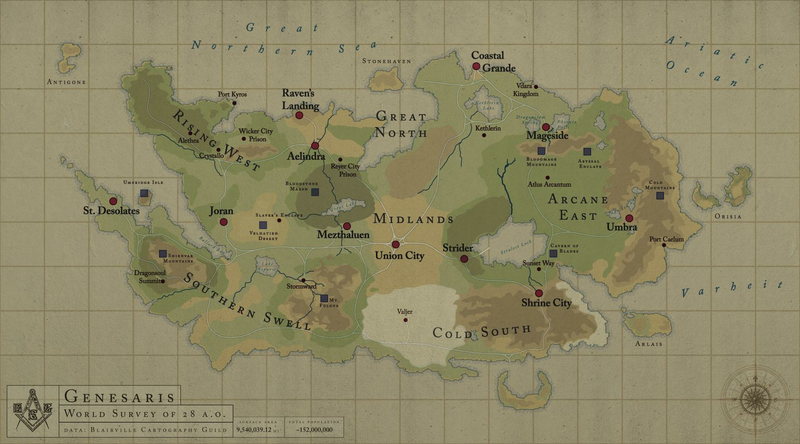 These are: Aelindra City, Capital of the Rising West; Shrine City, Capital of the Imperial South (Cold South & Southern Swell); Union City, Capital of the Midlands; and Umbra, Capital of the Carmine Dominion (Arcane East & Great North). While these are undoubtedly the most important of the continent’s megacities, they are only a few. Many of those inside the cities live with luxuries and the many benefits of magitech, thanks to the prevalence of both magic and technology taught throughout the lands. Between these cities are a number of disparate villages, towns, ports, baronies, and lordships. Even so, there is still a considerable amount of land that remains wild and untamed by expansion, beckoning adventurers and explorers with the promise of fortune. The islands of Genesaris, most notably Antigone Isles, Nvengaria, and Orisia Isle exist under their own government and rule, independent of Union City and the other mainland governments. It is rare for any citizen within the capitals or megacities to be illiterate. They are a well-educated people in the traditional sense (maths, sciences, and liberal arts), with a pension for the occult, as well. That has been a great cultural investment in the arcanum since the beginning of the nation's existence, which has expanded into the inclusion of blending the metaphysical with current technology. This is more prominent in some areas than others, such as with the Imperial South and Carmine Dominion, which thrive on such unification. Those who live in smaller towns and villages are less likely to be as finely educated in the traditional sense, but are still likely to grasp simple-to-moderate concepts (middle school to early high school education levels). It is, of course, not unheard of for mages and other spellcasters to have taught themselves their special art, coming into contact with their magic through intuition and unique talent. Most civilians are as prominent Genesaris’ peoples are often magically inclined, capable of sensing the arcane. A long history of bloody civil wars between regions has, for many years, made military education a priority for many of the nation's cities and people. This has led to a significant number of military academies throughout the nation (at a 2:1 to traditional education academies), and a cultural sensationalizing of gladiatorial events and war games. Standard battle training is generally available to all who seek it, either through the local or federal governments. Genesari is the primary language of Genesaris. It is spoken in every megacity and in most major establishments (smaller cities, large towns, villages, and baronies), and is considered the national language. It is also referred to as common, trade tongue, and sometimes genspeak. Genesari's primary dialect sounds like German (users should treat this as a plot device and are not expected to learn to write German). The are other predominant languages throughout Genesaris, namely in the Carmine Dominion and Imperial South. In the former, the predominant language - among the pious and imperial nobility - is Sitraic. In the latter, the preferred language is known as High Kadian and is spoken by both nobles and commoners alike. Nearly all of the Genesarian population is aware of the existence of magic to some degree, and throughout the generations, most - if not all - people native to the continent have developed a "sixth sense" which allows them to sense the arcane in its various forms (from spells and wards all the way to psionics). This has led to a number of edicts and bylaws over the years that seek to control the spread of magical use, limiting the dangers. On the opposite side of the spectrum, there are a number of institutes dedicated to the expansion and further study of the arcane and its many uses. Two of the most prestigious establishments joined in this cause are Bronte, the Academy of the Arcane and the Mage Academy located in Mageside City. There is a great abundance of religions throughout Genesaris, with many different regions worshipping a variety of gods and goddesses. Generally tolerant of open ideas and religion due to its size and diversity, Genesaris has many bibles and holy texts and art dedicated to all of these deities and celestial lords. Of them all, the three primary religions of the nation would be the Trinity of the Cold Mounts (High Lords), the Altus Arcantium, and the Sitraic Faith. While this trio all have their own pantheons and tenets, they hold the largest congregations by far, with influences reaching from coast to coast. Until the current century, the majority of Genesaris operated on early-to-mid Renaissance period technology. There was a significant lack of telecommunication, self-powered vehicles (with the exception of airships), and sophisticated operating systems (computers, surveillance, or radar). However, with the continued growth of Joran City and Antigone Isle, along with the rise of the Imperial South, Genesaris has developed small pockets of highly-advanced territories, arguably some of the most advanced on the planet. The pushing of this hard-technology boundary has bled into the nation’s more ideal magi-tech fronts, leading toward something of a technological revolution over the last one hundred years. This is more prominent in some areas than others, yet the national importance cannot be overstated enough. In most cases, magic - whether raw ether channeled from the atmosphere or various manifestations, such as crystals - plays a vital role in almost all of the nation’s technological advancements (spare for regions like the Imperial South, which have dedicated themselves to hard-technology paths, such as legitimate machines that operate on non-occult power sources). This has led to the nurturing of the idea that technology is something that is learned, understood, and developed further, not picked up and used (with a heavy emphasis in the educational curriculum). Like with most privileges of rural versus suburban areas, technological advances and availability are more bountiful in densely populated areas (megacities, capitals, etc.) as opposed to smaller towns and villages. Despite the continued proliferation of hard-technology and magi-tech throughout the nation, there still exists a great number of areas in Genesaris that lack these advancements (and the desire to have them). Coupled with the fact that beyond the Rising West and Midlands, the Carmine Dominion and Imperial South operate autonomously as independently governed bodies, there can sometimes be disparaging differences in advancements. Detailed below are just some of the methods of communication available throughout Genesaris and its regions; this is not an all-inclusive list. Tried and true, the messenger system is still a thriving communication network in Genesaris. While boasting a larger presence in small towns and villages than in the magi-tech abundant megacities, the Genesarian courier network is actually quite extensive (and similar to today’s mailing service) and encompasses both humans and well-trained avians. Despite advanced security measures taken both by clients and the courier system, troubles with interception and authenticity remain an issue. As such, these are rarely used for matters of importance, and best reserved for more casual correspondence or deliveries. In the Carmine Dominion, there has been an increased significance placed on communication since its annexation of the Great North territories. The need to correspond sometimes vital information over great distances has led to a focus on authentication (assurance of claimed identity), integrity (assurance data has not been altered), and confidentiality (assurance that none but the specified parties can read said data). Through mega-telecom corporations like Mormont and Sons (CG) and DRAKE Technologies (CG), the Dominion is rapidly becoming a defining force in the field of military-grade encryption. As part of the Kadian Empire, the Imperial South utilizes a wide array of communications technology, allowing the vast nation to maintain lines of communication needs both civilians to administrative. Radio Waves are used for much of Kadia’s ranged terrestrial communications, the empire has spared no expense in its advancement. Electricity and light are another two prime examples of how the Kadians have advanced their technology and applied it throughout all innovations. An optical fiber is often used throughout the empire and allows for far faster and more reliable communications; especially in the development of laser communications. Laser communication is often used off-planet or to send important of classified information quickly and securely, utilizing orbital and extra-orbital satellites and ships. Transportation varies from city to city depending on their magi-tech saturation and biomimicry level. Examples of common transportation methods will be included in the lore articles of each city. Below are elaborations on those methods. Whether ridden by themselves or attached to a cabby. The maintenance and upkeep of a living transport make this a largely inefficient form of inner city travel, but because a large percentage of a given city's population is travelers from abroad, a lot of infrastructures still supports this form of travel. Powered by magical crystals known as Exlata, airships are the most popular form of travel. For a small fee, most can ride on a large airship that flies to and from various cities. All megacities and most smaller cities have stations, bays, and areas where airships are able to land. Almost all airships carry weaponry and shields to protect against air pirates. For travel by sea, basic seaships are used, which vary in size and carry weapons for protection against sea pirates. Currently, Spellcycles have been created, similar to motorcycles with a futuristic/steampunk design. Powered by the magical crystals Exalta, these are expensive rides and can only be bought in Joran City and straight from Antigone Isles, the home of their creation. Inter-city travel is served primarily by smaller airships and Crossroads. Crossroads are generally gateways that provide instant travel throughout a city and often to and from cities. Crossroads are keyed to certain areas and the side effect is nothing more than mild disorientation that passes quickly. Guarded by soldiers, Crossroads are cheap, easy, and effective to transporting goods and civilians alike. Sometimes, magical creatures pass through from realms beyond, in which case the soldiers must deal with them. Generally, however, the Crossroads are kept safe and steady. There are found in every megacity and are currently online. With the formation of the Imperial South and Carmine Dominion and their continued growth, the Genesarian political landscape has shifted quite noticeably. While the High Lords are still regarded as the supreme rulers of Genesaris, they rarely venture from their mountains to associate with human matters. More recently, they have been said to have retreated further from the mortal affairs of the world, with some whispers claiming the three great entities have all gone into stasis. In what remains of Genesaris proper (The Midlands and Rising West), all things concerning the law or government proceedings are handled by the High Court, a democratically elected council of 15 individuals from the West and Midlands. The council's grand meeting chamber is located in the Hall of Justice, which can be found at the heart of Union City. The High Court is seen as the place of wisdom, Union City itself a respected neutral city. Entire wars, ceasefires, alliances, and treaties have been declared at the High Court. In the Carmine Dominion, the current emperor, Rafael M. Bartolome V, is recognized as both the absolute monarch and prime deity of the Sitraic Faith. His rule has been described as an enlightened theocracy with strong elements of authoritarianism. From birth, citizens are indoctrinated into absolute subservience to the Lord's throne and his agents, sometimes at the cost of their personal freedom. The arts, sciences, education, and social welfare all flourish under Rafael's regime, a near polar opposite to the dark ages of warring tribes and inter-region isolationism. As the Dominion was host to a number of independent city-states and self-sustaining establishments prior to the rise of the Empire, it was decided to allow these kings and queens of old to retain control over their holdings. Because of this autonomous manner of ruling, there is a great deal of variation in the regional governments within the Empire. So long as these Lords fulfill their duties to the broader Empire and operate within the Imperial Edict's boundaries, their rules will generally be accepted by the higher authorities with little or no interference. Author's note: I don't have a full legal system written out and likely never will because the complexity of that endeavor doesn't interest me. In terms of what's legal reference real bodies of law for basics, so imagine that things like theft, assault, perjury, slavery, murder and so on are illegal. Each city has a local police force to operate within its limits and the military employs federal investigators who are able to enforce law anywhere in the nation. Prior to the separations of the Cold South and Arcane East from Genesaris proper, and the annexations of the Southern Swell and Great North, respectively, Genesaris had a unified military of ~6.25 million, with over 800,000 reservists (a potential total of 7.08 million). This daunting number was once scattered across six separate regions, though could be unified at the command of the High Council of Union City, facing national a crises. Since then, this number has been fragmented between the three prime factions with the Dominion obtaining the largest section due to acquiring the North (42%), then the Imperial South (38%), and the Genesar Remnants retaining all that remained (20%). In the realm of the Dominion, their emperor also serves as their Commander-in-Chief, exercising total authority over the military. The empress, Irene Gabriela DuGrace, is Rafael’s chief advisor and possesses the highest level of authority - military or otherwise - other than the emperor, himself. They are both involved in the day-to-day responsibilities of maintaining the military, government, and nation. There are a number of military outposts, bases, and depots located throughout their lands. The most secure of these are found within Umbra, the Red City, and Coastal Grande. Pre-schism, due to its size and a war with Terrenus, Genesaris practiced isolationism, suspicious of other lands. Traces of this practice can be seen in the Carmine Dominion's foreign policies, which practice an alternate form of isolationism. While prioritizing their own ends over that of the world, they are firm believers of free trade, travel, and in some instances (namely those that are significantly beneficial to the empire either politically or economically), have been known to enter loose trade agreements. The Chip is made of cheaply made pot metal , easy to cast and easy to gather from the streets, typically a majority of zinc with alloyed with other scrap metal. When one is used up, it is collected and recast into a new chip coin. These are the most common coins, used for everyday small purchases. A single pot metal can buy you a couple of eggs or half a loaf of bread. A Rosy is made from an oxidized manganese, its color a silvery pink. It bears a picture of a Finch, its namesake. These are uncommon but exist in circulation. A Kite is made from bronze. It has the picture of a Kite (bird), its namesake. These are common coins. A Raven is made from a zirconium alloy, making this coin almost jet black. If one looks close enough, they can see a picture of a Raven etched in. These coins are uncommon, but do make their way around. Some people collect them. A Merlin is made from silver. It has a picture of a Merlin Falcon etched upon it. This is a common currency for bigger purchases. A Hawk is a gold coin. It has a depiction of Aletheiar in his Golden Hawk form. These are commonly used in expensive transactions, such as buying property or an airship. They are rare in smaller purchases. Jewels, gems, and other valuable metals can also be used and traded among the shops and merchants of Genesaris. Due to inflation, wars, and other variables, the value of any currency may heighten or drop to reflect the times. Vihij of Darkness, Ekle of Light, and Uyie of the Gray form from nothingness. The Old Gods form Night and Day, followed by the Elder Gods, vanishing thereafter. Using the elements they are formed of, the Elder Gods give form and life to Genesaris, sacrificing their essence until only the God of Thunder, Zare, remains. Life begins in the North, spreading outward to populate the entire continent. As humans advance and gain knowledge, factions and royal houses are formed. Battles and duels proving greatness and dominance are popular. Rebels of authority and assassins evolve into Edgemasters and Stealthmasters. A powerful deity known as Salakahr appears, gathering followers. Promotion of power through fear and violence; prejudice, formation of slavery and segregation and other corruptions spreads throughout the nation. A plague sweeps the nation, taking the lives of many and infecting more. Those who are sick or suspected as carriers are rounded up and thrown into the Western Sea. The old and mentally ill follow them, their bodies washing up on a small island, Umbridge Isle. Genesaris brings war on Salakahr; Edgemasters, Stealthmasters, and Phantomblades unite. Salakahr is sealed away in the earth. Slavery is officially outlawed[ii]. Umbrdige Isle grows the sacred black roses of martyrs and the unjustly killed. The Four Lands are created: the Great North, the Cold South, the Majestic East, the Glorious West. The Great North expands and dominates council positions, seeking more power and land, eventually assassinating the most influential of the Cold South lords. The Cold South retaliates, killing and razing the royal houses of the North. Five years of war and exchanges of treaties, alliances, and betrayals ravage Genesaris. The South is defeated. The Great North rules Genesaris and brings prosperity and economic balance. The East, West and South unite, eventually forcing the North back to its original, limited territory, declaring independence among their own respective lands. The Union City Council is formed in the new Midland: now known as the Five Lands. National wars are kept in check by the Council; civil wars and riots between the city-states and various kingdoms rise instead. Eventually, the lands break apart. The Council approves the next war. Airships are created by Krysta Uhltoria. Wars based over land and religion rises. The legendary airship Godhanger becomes piloted by her and Ryer Shantell under the guidance of Zare, the Lord of Thunder. The power of this airship and the crumbling of both armies ends the war. The Elder God Zare leads Uhltoria and Shantell to the peace and isolation of the Eastern Grasslands. They become the first of a new people, worshipping Zare who speaks of a prophecy known as the Black Hourglass Dream. The young leader Altus Arcantium is blessed by Zare, raising new if unorthodox beliefs. At death, Altus Arcantium rises to godhood, cementing the new religion named after him. The barrier of Genesaris falls as the High Lord Vikturiel disappears, exposing Genesaris to other lands; Terrenus, Tullus Mater, and Iselyr. The chaos this unexpected event incites destabilizes authorities; seeing more chances for power, another war started by the North begins to take place, though it doesn't last long as the other lands quickly shut them down. Arcantian Fourth Leader Black Solar Dawn kidnaps Odin Haze. Odin Haze escapes, but returns to save Solar from the death penalty set by his own people. Taking Solar to Terrenus, Solar performs an unorthodox penance as Odin’s guest. Sometime later however, when things appear to be at least somewhat calm, Odin Haze travels to Genesaris and destroys a being known as Ziren Rhizae. Arcantian Third Leader Bright Lunar Dream awakens as the Black Hourglass Dream, with White Crimson Night as his anointed Seer. The prophecy is set in place as Odin Haze’s murder of Ziren causes a disruption of the balance of night and day the Arcantians consider inviolable and sacred; Eternal Night sweeps Genesaris along with the rest of Valucre, causing massive damage. Light is eventually returned but the Altus Arcantians declare war on Odin Haze, seeing him as a threat to the balance. Deciding to serve Odin instead of his own people, Solar builds the first airship since the Magestorm Years; Salt Pie 2. Raising Godhanger, the war begins with a furious start. The Arcantians win the first battle and the rise of Eleos, which Odin Haze razes. Pyrrhic victories on both sides and heavy losses end with a ceasefire, both ships sunk in the sea. Partial awakening of Solar as the true Black Hourglass Dream. He does not know it, although the High Lords and his own anointed seer, Zane, do. After the last victory won by Odin Haze, Solar is fused with Vikturiel, the missing fourth High Lord. In the meantime, Justin is working on forming a sort of allegiance with the southern island Nvengaria with its Countess Cordeliane, betrothed by default to the unwilling Super Eclipse, Shawn Veruacor. Sensing a certain shift in the future, Aletheiar Alazar Resurrection, de facto leader of the High Lords, makes a visit to the Black Queen’s masquerade. It is revealed the Black Queen is the balance of Darkness to Light. In the recent months, a terrible phenomenon took place. Known as Whispernight Ragnarok, cities were destroyed en masse by legions of supernatural foes – ghasts, wrathful spririts, liches, vampires, and more. Their arrival heralded by a supernatural fog, they swarmed the cities. In the wake of their passage, however, there arrived yet another threat; mankind. A few took advantage of the resulting chaos of Whiserpnight Ragnarok. Listed below are the cities that suffered the most damage as a result not of Whispernight, but of mankind. The once prosperous Telerian City rushed to evacute the citizens, but in theend overrun by a mass uprising of the dead and many were slain. This new city was flourishing when Whispernight struck. They put up a hefty resistance to the Whispernight attack when, inexplicably, the city fell, plundered and completely wrecked by the horrific monstrosities of Ragnarok. It is said that three known as Mathais, Del Graz, and Arashi are responsible for laying siege and destroying the spirit of the people, taking them as slaves and leaving the city to burn. The capital of the Southern Swell was one of many to fall. The educational and prized academies of this city struck the nation as a great loss, mostly because of the dragon that assaulted the city. The dragon was slain by three known as Raean, Aisha, and Chromillia, but many were lost to the beast regardless. These two cities fell, presumably also the efforts of Illumad. Airships were stolen, delaying the evacuation of numerous citizens and leaving many to die. It is unclear what exactly happened, but it is apparent that Illumad’s reputation as a frightening opportunistic city is growing. With the destruction of Ballard Bay, the Southern Swell joins with the COld South, which renames itself the Imperial South. The Imperial South is now the largest kingdom of Genesaris next to the Carmine Empire.